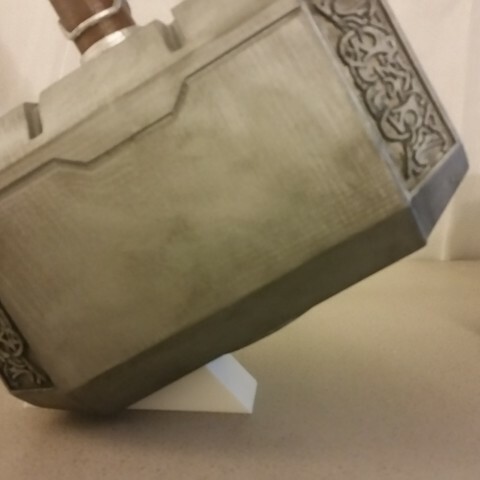 ﻿This is a fully 3D printed Mjolnir. I made it life size. I'm sure it's not the exact dimensions of the movie prop but it's close. It can also be scaled pretty easily. 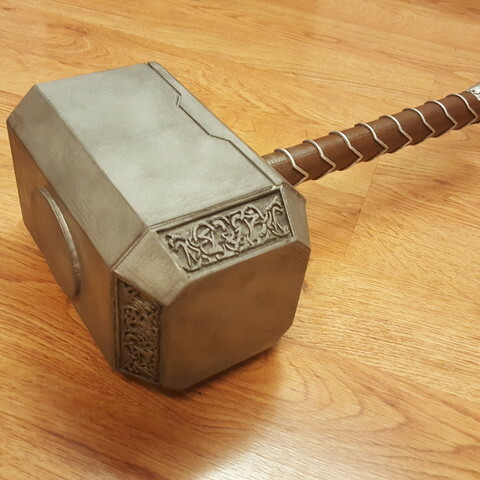 This version of Thor's Hammer is specifically from The Dark World movie. I'll provide the steps for post processing in a lot of detail below, but if you want a higher level look at it, watch the video. ﻿ I provided two different options for the main part of the hammer. It prints in 2 sections, and they are identical so just print 2 of them. There is a hollow one if you're looking to save a bit of filament (this is the option I took). But I also provided a solid one that will print in a better orientation if you're able to spare the extra filament. The solid option will also provide more weight which could add to the realism of it. ﻿All of these settings are more or less flexible. The only supports you'll need are for the little slot on the bottom of the bigger portion of it. But they aren't strictly necessary. I didn't use any supports while printing, I just had to do some clean up. I printed at 0.3mm layer height but you could increase that for better details. I was just trying to save some filament. And infill doesn't matter too much here. ﻿Step 0: Print all the parts. ﻿Step 1: Sand the parts down as much as possible. The details on the handle and the outside of the hammer can be pretty hard to get smooth, but do your best. The sides of the hammer should be completely smooth to the touch though. Start with a coarse grit sandpaper in the ballpark of 100 grit. Then move up to 400 or above to get the best results. ﻿Step 2: Glue the parts together. Use the printed pins to hold the parts in place, then apply glue to those pins to adhere them together. I used a Gorilla Glue Two Part Epoxy, glued the parts and held them for a bit until they dried. Then once the parts are together, take a paint brush or something similar to apply the epoxy generously over any cracks or seams you want to cover. Then once the glue has dried completely, sand the areas over seams to get those smoothed down as well. 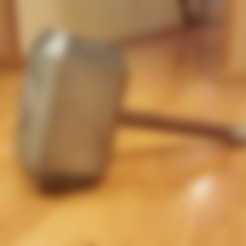 ﻿ Step 3: Prime the hammer. We chose to use a black spray primer from Krylon. Coat the hammer at least twice, letting it dry completely in between coats. Just lightly spray across the surface using a normal spray painting technique. Don't stress too much about the detailed areas at this point. ﻿Step 4: Painting the hammer. We used a Hammered Metal spray paint. Specifically silver colored. Apply 3 coats of this, letting it dry completely in between. If needed, you can sand any rough areas in between coats. Just use your judgement on what looks best. 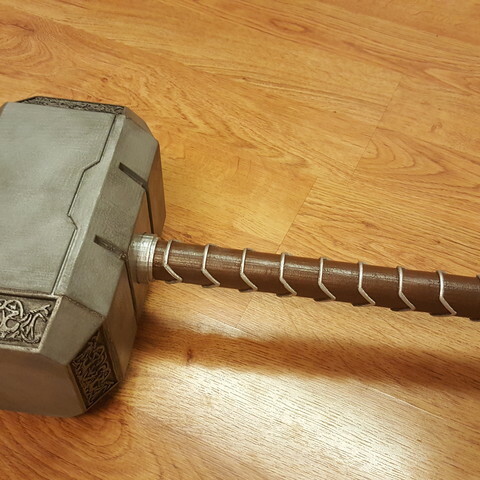 The paint should fully cover the hammer. ﻿Step 5: Paint the handle. For this you'll need a paint brush and some brown acrylic paint. Paint the brown on the lower areas of the handle, leaving the silver rings and base of the handle as is. Make use of multiple brushes to get into hard to reach areas. Apply 3 coats of this to get a smooth, but plentiful coverage of paint. You can always go back over the details on the handle with silver paint if you need to. ﻿Step 6: Apply a wash. I won't go into a ton of detail about the wash. You can YouTube "applying a wash to miniatures" if you want more details. We took some silver and black acrylic paint, mix it and watered it down significantly then applied it to the details on the handle and on the sides of the hammer. Use a paper towel or spare paint brush to dab off excess. This will give the recessed areas a more defined shadow. ﻿Step 7: Rough it up. This step involves taking sand paper to the paint on the bulk of the hammer to give it a worn and used look. Go around the edges and just lightly sand it to give it a more textured look. Then take some of your paper towels you used to clean off the wash and lightly dust that darker color across the body for even more texture. ﻿Step 8: Apply a finish coat. You can get some spray clear coat and just spray the whole thing once it's completely dry and done. This will help protect it from damage like scratches to the paint.